This house plan welcomes with a metal porch covering, classic columns, and multiple gables. Sidelights usher light around the entrance, and porches expand living outdoors. 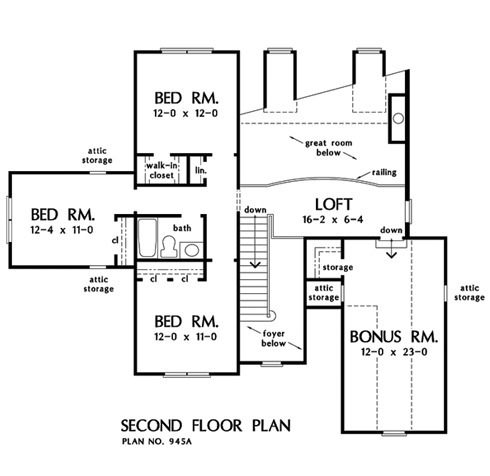 Creating a natural traffic flow, this floorplan is family-efficient. 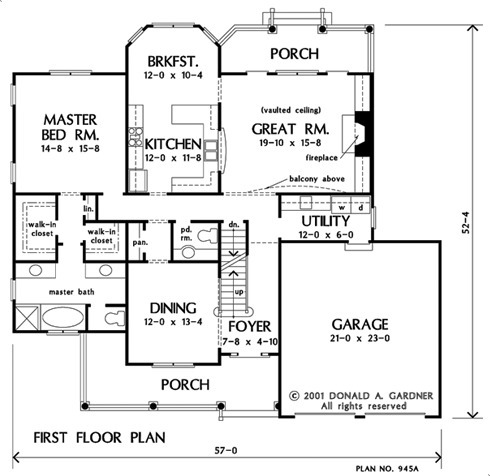 Note the kitchen pass-thru, bonus room, second-floor loft, counter space, built-ins and the extended breakfast nook. 1st Floor: 1667 Sq. Ft. Bonus Room: 318 Sq. 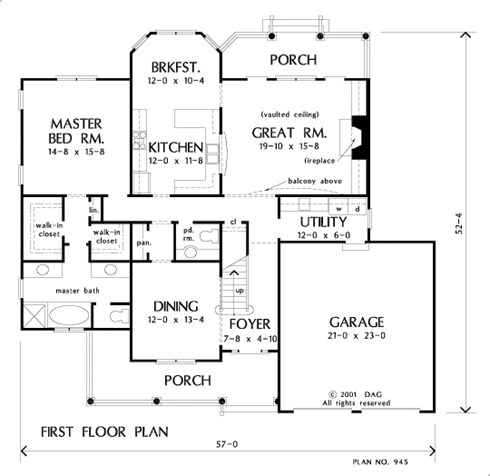 Ft.
House Dimensions: 57' 0" x 52' 4"
Great Room: 19' 10" x 15' 8"
Master Bedroom: 14' 8" x 15' 8"
Foyer (2 Story): 7' 8" x 4' 10" x 18' 1"
Great Room (Vaulted): 19' 10" x 15' 8" x 18' 1"
Bonus Room (Vaulted): 12' 0" x 23' 0" x 9' 5"
Master Bedroom : 14' 8" x 15' 8" x 9' 0"
Porch - Front : 26' 4" x 6' 0" x 0' 0"
Porch - Rear : 20' 4" x 6' 4" x 0' 0"
Loft / Study : 16' 2" x 6' 4" x 8' 0"
Storage (Other) (Sloped): 3' 4" x 5' 4" x 0' 0"
Storage (Bonus) : 4' 2" x 4' 8" x 0' 0"